An inadvertent addition to the growing trend of movies going straight to video on demand, Boon Joon-Ho’s Snowpiercer, along with Mike James’ Roger Ebert opus, Life Itself have forever changed my mind on the value of the market. The futuristic disaster survival film pushes the theme of apocalypse into its most philosophical ideal. The performances, direction and script are exceptional throughout, bringing it to the top of the list of the genre. The story begins with a fallacy about global warming, given the temperature decline in the last 18 years have forced the alarmists to change the name to “climate change” to make it more ambiguous and still guilt inducing. What is closer to reality is the lunatic decision to introduce an element into the upper atmosphere to “cool” the planet. The attempt immediately backfires and the world is immediately frozen over, killing almost everything. Among the survivors 17 years later are people in a train that runs a continual loop around the world. The train has many cars, and two classes of people. Those in the front – the upper class – enjoy all the good things that that are still around. The suffering folk are in the rear of the train. They have to dine on mysterious bars of protein that are somewhere between Fig Newtons and hot dogs on the gross scale. Another unfortunate result of their position is the occasional loss of a child or talented adult. Amidst the downtrodden is Curtis Everett (Evans), who formulating a plan to turn the tables on the oppressors. Working with Gilliam (Hurt), he has received a series of messages from mysterious sources. Each of the messages is a clue meant to spur him along, through each car and into the next. What he faces at each stop never ceases to be a challenge both intriguing and original. There to help him along are Minsu (Kang-Ho), Yona (Go Ah-Sung), Edgar (Bell) and Tanya (Spencer). That each of these characters is interesting is a tribute to the acting, direction and script being in perfect cohesion. Kang-Ho and Ah-Sung in particular add dimension to the story in rising above what one would normally see in a story of this type. Even in The Road Warrior, we have no interesting characters outside of Gibson’s and the feral child. Interesting only begins to describe Tilda Swinton’s Mason, who is the mouthpiece for the upper crust. Swinton solidifies her hold as the queen of weirdly mean as she informs everyone what is expected of them and what they will lose if they don’t relent. The film gets much of its power in creating a nemesis that continues to confound even when she is not firmly in control. Evans, however, reaches the next level with his performance as Everett. He spent so many years as an average actor in fluff like The Losers and Fantastic Four that it’s been amazing to watch his transformation into a major leading man through similar, but just plain better characters like Steve Rogers (Captain America / Avengers) and Lucas Lee (Scott Pilgrim vs. The World). His Everett is a tortured but brave man with secrets that break one’s heart to hear revealed. Curtis’ contemplative discussions with Minsu raise the bar for contemporary moral philosophy in film. Even more, it’s got more heart than anything I’ve seen since Field of Dreams. Joon-Ho, whose disagreement with The Weinstein Company over the length of the film, stuck to his guns in one of the many good decisions made in this movie. The visual images are striking, particularly the first battle to move forward and a spectacular battle in the darkness of a tunnel. There is no lag at all in the story, showing spectacular editing to match the cinematography of Hong Kyung-pyo. The wish to watch the film immediately after the credits roll is as strong as this reviewer has felt in some time. The only let down in the film is the discussion in the engine car. There is supposed to be some surprise in who is running the engine, but the rationale that the engineer gives for the preceding 2 hours is unconvincing. Thankfully this does not change the inherent character of the protagonists and ultimately gives the very end a nice touch. 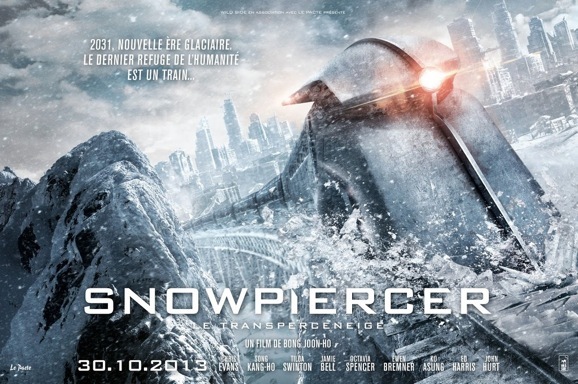 If one gave Snowpiercer a rental, there is little doubt that they will buy it. Thank goodness I followed my instincts that the advanced word was right enough for me to make the purchase. Let yourself go into the story and give in to the feeling. If you do, you will see and feel more movement than just a train. Previous Post Dawn of the Planet of the Apes: Haven’t they already Risen?